Recently, I had occasion to learn about fixed effects and random effects models (as well as the larger subject known as hierchical or multi-level modeling) in the context of analyzing patient longitudinal data. This posting is about one particular question that interested me in this work: For a given variable, how much of the variation in the values is due to within-group effects versus how much is due to between-group effects. For the longitudinal patient data, the groups were repeated measurements on the same individual. For this discussion though, I'll ask questions such as "How much of the variation in zip code population is due to variations within a state versus variations between states?" I leave it to the reader to generalize this to other areas. The data used is the census data on the companion web site to my book Data Analysis Using SQL and Excel. Also, the spirit of understanding this problem using SQL and charts also comes from the book. This posting starts with what I consider to be a simple approach to answering the question. It is then going to show how to calculate the result in SQL. Finally, I'm going to discuss the solution Paul Allison prsents in his book, and what I think are its drawbacks. What Does Within- Versus Between- Group Variation Even Mean? I first saw this issue in Paul Allison's book Fixed Effects Regression Methods for Longitudinal Data Analysis Using SAS, which became something of a bible on the subject while I was trying to do exactly what the title suggested (and I highly, highly recommend the book for people tackling such problems). On page 40, he has the tantalizing observation "The degree to which the coefficients change under fixed effects estimation as compared with conventional OLS appears to be related to the degree of between- versus within-school variation on the predictor variables." This suggests that within-group versus between-group variation can be quite interesting. And not just for predictor variables. And not just for schools. 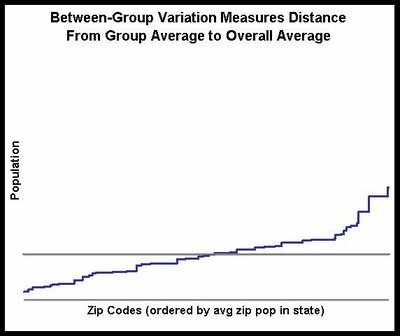 Let's return to the question of how much variation in a zip code's population is due to the state where the zip code resides, and how much is due to variation within the state. To answer this question analytically, we need to phrase it in terms of measures. Or, for this question, how well does the average population of zip codes in a state do at predicting the population of a zip code in the state? In answering this question, we are replacing the values of individual zip codes with the averaged values at the group (i.e. state) level. By eliminating within group variation, the answer will tell us about between-group variation. We can assume that remaining variation is due to within group variation. 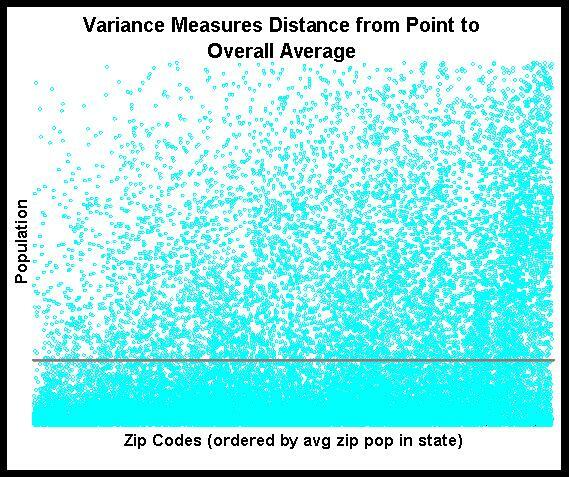 Variance quantifies the idea that each point -- say the population of each zip code -- differs from the overall average. 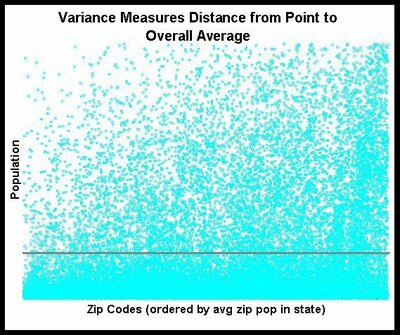 The following chart shows a scatter plot of all the zip codes with the overall average (by the way, the zip codes here are ordered by the average zip code population in each state). The grey line is the overall average. 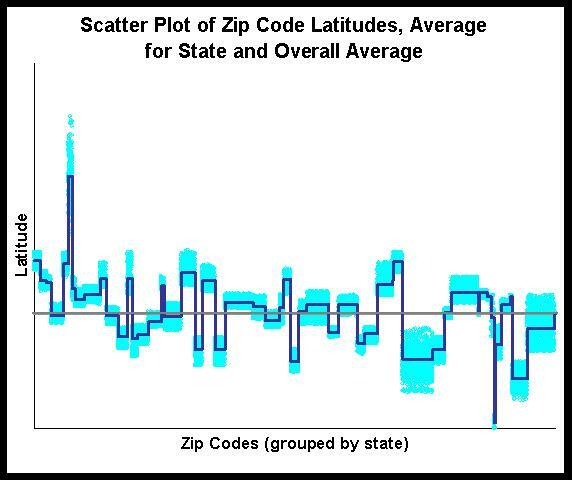 We can see that the populations for zip codes are all over the place; there is not much of a pattern. As for the variance calculation, imagine a bar from each point to the horizontal line. The variance is just the sum of the squared distances from each point to the average. This sum is the total variance. The blue slanted line is the average in each state. We see visually that much of the variation has gone away, so we would expect most variation to be within a state rather than between states. The idea is that we measure the variation using the first approach and we measure the variation using the second approach. The ratio of these two values tells us how much of the variation is due to between-groups changes. The remaining variation must be due to within-group variation. The next section shows the calculation in SQL. First note that I snuck in the calculation for both within- and between- group variation, even though I only explained the latter. The from clause has three subqueries. Each of these calculates one level of the summary -- the value for each zip, the value for each state, and the overall value. All the queries rename the fields to some canonical name. This means that we can change the field we are looking at and not have to modify the outer SELECT clause -- a convenience that reduces the chance of error. In addition, the structure of the query makes it fairly easy to use a calculated field rather than just a column. The same calculation would need to be used for all the fields. And finally, if you are using a database that supports window functions -- such as SQL Server or Oracle -- then the statement for the query can be much simpler. 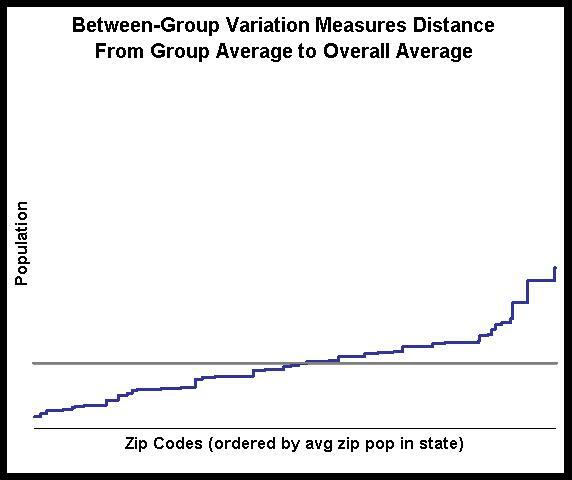 The results for population say that 12.6% of the variation in zip code population is between states and 87.4% is within states. This confirms the observation that using the state averages removed much of the variation in the data. In fact, for most of the census variables, most of the variation is within states. In this scatter plot, we see that the zip code values in light blue all fall quite close to the average for the state -- and in many cases, quite far from the county average. This makes a lot of sense geographically, and we see that fact both in the scatter plot and in the within-group and between-group variation. Finally, it is instructive to go back to Paul Allison's book and look at his method for doing the same calculation in SAS. Although I am going to show SAS code, understanding the idea does not require knowing SAS -- on the other hand, it might require an advanced degree in statistics. And, as he states, "the proportion of variation that is between [states] is just the R-squared from this regression." This statement is called a procedure (or proc for short) in SAS. It is calling the procedure called "glm", which stands for generalized linear model. Okay, now you can see where the advanced statistics might help. The "model" part of the statement says what model to build. In this case, the model is predicting population, but not using any input variables. Actually, it is using input variables -- the indicators for each state created on the "absorb" line. Doing the calculation using this method has several shortcomings. First, the results are put into a text file. They cannot easily be captured into a database table or into Excel. You have to search through lots of text to find the right metric. And, you can only run one variable at a time. In the SQL method, adding more variables is just adding more calculations on the SELECT list. And the SQL method seems easier to generalize, which I might bring up in another posting. However, the biggest shortcoming is conceptual. Understanding variation between-groups and within-groups is not some fancy statistical procedure that requires in-depth knowledge to use correctly. Rather, it is a fundamental way of understanding data, and easy to calculate using tools, such as databases, that can readily manipulate data. The method in SQL should not only perform better on large data sets (particularly using a parallel database), but it requires much less effort to understand. This post is an extention of an earlier post. If you are interested in this, you may be interested in my book Data Analysis Using SQL and Excel. Group A has 81 members. Group B has 25 members. 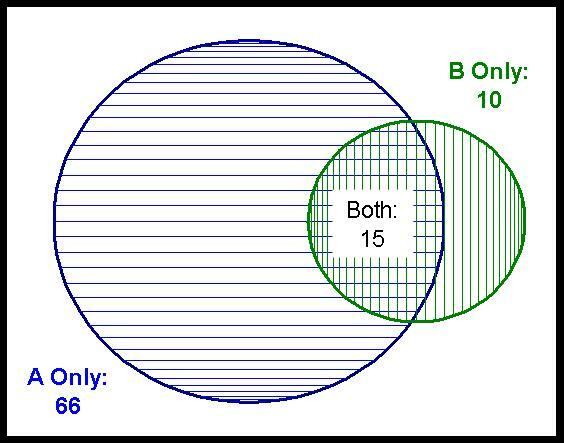 There are 15 members in both groups A and B. Unfortunately, creating a simple Venn diagram is not built into Excel, so we need to create one manually. This is another example that shows off the power of Excel charting to do unexpected things. We need to draw a circle with a given radius and a center at any point. We need to fill in the circle with appropriate shading. We need to calculate the appropriate centers and radii given data. We need to annotate the chart with text. Each of these are explained below. All of the charts and formulas are available in the accompanying Excel file. Where E4 contains the X-offset; F4 contains the Y-offset; and D4 contains the radius. 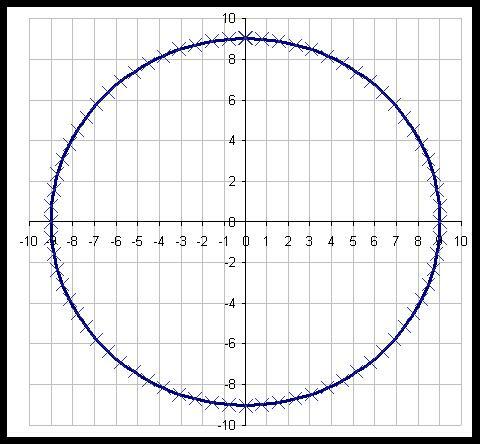 The degree values need to extend all the way to 360 to get a full circle, which can then be plotted as a scatter plot. When choosing which variety of the scatter plot, choose the option of points connected with smoothed lines. 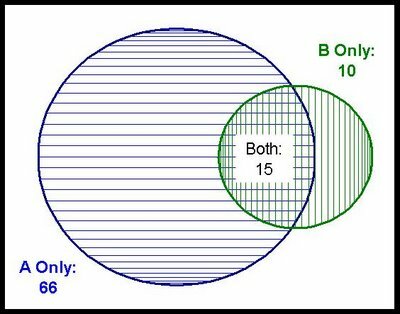 Creating a second circle is as easy as creating one, by just adding a second set of series onto the chart. The idea is to create X error bars for horizontal lines and Y error bars for vertical lines. To do this. right click on the circle and choose "Format Data Series". Then go to the "X Error Bars" or "Y Error Bars" tab (whichever is appropriate). Put 101 in the "Percent" box. This adds the error bars. To format then, double click on one of them. You can set the color for them and also remove the little line at the edge. You will notice that these bars are not evenly spaced. The spacing is related to the degrees. With the proper choice of degrees, the points would be evenly spaced. However, I do not mind the uneven spacing, and have not bothered to figure out a better set of points for even spacing. So, getting the radii for the two circles is easy. The questions is: where should the second circle be place to get the right overlap? Unfortunately, there is no easy solution. 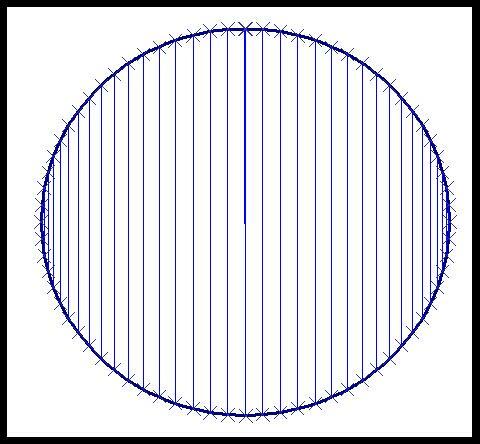 First, we have to apply some complicated arithmetic to calculate the overlap between two circles, given a width of the overlap. Then we have to find the overlap that gives the correct area. The first part is solved by finding the area of overlap between two circules, at a site such as Wolfram Math World. The second is solved by using the "Goal Seek" functionality under the tools bar. We simple set up a worksheet that calculates the area of the overlap, given the width of the overlap and the two radii. One of the cells has the difference between this value and the area that we want. We then use Goal Seek to set this value to 0. Then, we inlcude this text in the chart by selecting the chart, and typing "=" and followed by the cell address (or using the mouse). In the end, we are able to create an accurate Venn diagram with two circles, of any size and overlap. Should model scores be rescaled? We often use neural nets to create a decimal range score between zero and one (0.0 – 1.0), where zero equals no churn and maximum 1.0 equals highest likelihood of churn. Another dept then simply sorts an output table in descending order and runs the marketing campaigns using the first 5% (or whatever mailing size they want) of ranked customers. We have differing preferences in the distribution of our prediction score for churn. Churn occurs infrequently, lets say 2% (it is voluntary churn of good fare paying customers) per month. So 98% of customers have a score of 0.0 and 2% have a score of 1.0. When I build my predictive model I try to mimic this distribution. My view that is most of the churn prediction scores would be skewed toward 0.1 or 0.2, say 95% of all predicted customers, and from 0.3 to 1.0 of the churn score would apply to maybe 5% of the customer base. Some of my colleagues re-scale the prediction score so that there are an equal number of customers spread throughout. What are your views/preferences on this? I see no reason to rescale the scores. Of course, if the only use of the scores is to mail the top 5% of the list it makes no difference since the transformation preserves the ordering, but for other applications you want the score to be an estimate of the actual probability of cancellation. In general, scores that represent the probability of an event are more useful than scores which only order a list in descending order by probability of the event. For example, in a campaign response model, you can multiply the probability that a particular prospect will respond by the value of that response to get an expected value of making the offer. If the expected value is greater than the cost, the offer should not be made. Gordon and I discuss this and related issues in our book Mastering Data Mining. This issue often comes up when stratified sampling is used to create a balanced model set of 50% responders and 50% non-responders. For some modeling techniques--notably, decision trees--a balanced model set will produce more and better rules. However, the proportion of responders at each leaf is no longer an estimate of the actual probability of response. The solution is simple: simply apply the model to a test set that has the correct distribution of responders to get correct estimates of the response probability.